TORONTO, Canada, April 4, 2012 (ENS) – More than 130 large dams built, under construction, or proposed in western China’s seismic hazard zones could trigger disasterous environmental consequences such as earthquakes and giant waves, finds a new report from the Canadian watchdog group Probe International. The report shows that 98.6 percent of the dams being constructed in western China are located in high to moderate seismic hazard zones. John Jackson is a pseudonym for a geologist with detailed knowledge of western China who wishes to remain anonymous to protect his sources. In a worst-case scenario, Jackson reports, dams could collapse, creating a giant wave that would inundate everything in its path, including downstream dams, causing great loss of life and property. Should a dam suffer catastrophic collapse, says Probe International Executive Director Patricia Adams, Chinese citizens could direct their anger to the hydropower industry for threatening their lives with dangerous dams. To pierce the Chinese government’s secrecy over its dam building, the Probe report overlays a Chinese map of dam locations with U.S. Geological Survey earthquake data and a United Nations’ seismic hazard map. The map was prepared by HydroChina prior to 2004, with data confirmed by more recent surveys, and Google Earth satellite images. “Based on this review, it appears that about half of these dams have not yet been built, but that the pace of construction is rapid,” writes Jackson. A comparison of large dam locations and seismic hazard zones for dams that are built, under construction, or proposed for the Tsangpo, Po, Salween (known as Nu in China), Mekong (Lancang in China), Yangtze, Yalong, Dadu, Min, and Yellow river headwaters in western China, indicates that 48.2 percent are located in zones of high to very high seismic hazard. The remaining 50.4 percent are located in zones of moderate seismic hazard, and only 1.4 percent are located in zones of low seismic hazard. Earthquakes greater than magnitude 4.9 have been known to damage dams and other structures. Shallow earthquakes, less than 10 kilometers (six miles) deep, indicate active faults that could be reactivated by routine practices, such as the filling of a reservoir to accommodate flood waters and its drawdown to generate power, Jackson says. “In addition to the hazard of high natural seismicity in western China, reservoir-induced seismicity is likely to increase the frequency and perhaps the magnitude of earthquakes in this area,” he warns. 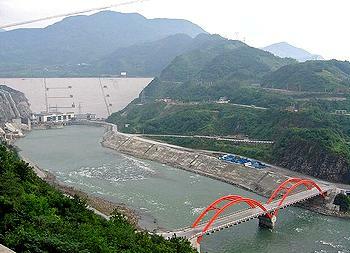 The Zipingpu Dam on the Minjiang River in southwest China, for example, is thought to have triggered the magnitude 7.9 Sichuan earthquake in 2008. The country’s worst natural disaster in three decades, the earthquake claimed more than 69,000 lives and left five million people homeless. The force of that quake cracked the dam and shook it so severely that it sank one metre and moved 60 centimetres downstream, Jackson says. Chinese, Japanese and American scientists argue that what happened to the 156-meter-high Zipingpu Dam is evidence of reservoir-induced seismic activity, while some Chinese scientists challenge the claim. Western China is known to be a large regional stress field because of the northward motion of the Indian subcontinent into western China. In geological terms, the movement is considered rapid. This “continental collision” has lifted seafloor sediments to the top of Mt. Everest and created the Tibetan Plateau. Since detailed recordkeeping began in 1973, an average of nine earthquakes with a magnitude of 4.9 or greater have occurred in western China each year. Especially worrying in this environment, said Jackson, is the cascade-like positioning of the dams which follow one another so closely there is no terrain between them for energy to dissipate in the event of catastrophic dam failure. “If one dam fails, the full force of its ensuing tsunami will be transmitted to the next dam downstream, and so on, potentially creating a deadly domino effect of collapsing dams,” he says. 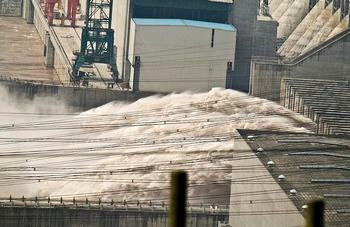 China is the world’s largest hydropower producer with some 87,000 dams and reservoirs, of which nearly half are considered to be dangerous and at risk of collapse. About about one-third of those are hydropower dams. In the interest of public safety and a sound power sector, the Probe International report urges the Chinese government to disclose the details of its current slate of dam construction, and to ensure that a thorough and independent regional seismic risk assessment is done without delay and publicly disclosed.